*These photo’s were taken before the heavy snowfall. Just to explain the silly title a bit. Hello there pretty faces. It’s 11:35am and I just got out of bed. Yes, I needed sleep that bad. Since I’ve missed already what feels like half of my day, I’m thinking I should keep it short and simple today. I do still have an objective study / paper to write today and I really want to get that one of my desk. It’s, again, a part of my thesis that I need to send in on the fourth for a quick review by my professor. This cardigan came it the mail a few weeks back. Even before the exams started, and I got it as some sort of motivational gift to myself. Which does not make any sense really. I don’t really own any other pink items but this pink dress, so I thought it would be a fun addition to brighten up my winter dresses for Spring. Pink also brings me into Valentines Day mood. We don’t really celebrate it, but with this outfit I still wanted to share a cutesy thing K did the other day. I couldn’t resist to take a peek at the answers on my reader survey early on new years eve. As expected, I didn’t get that much response just yet. Only 1 person filled out the questionnaire at that moment. It was super obvious who it had been: the boyfriend. His answers made me blush, laugh and maybe cry a little… from happiness that was. How did you end up on this little blog o’mine? Why Do you read The Ginger Diaries? Because I think you are a cute little thingy. And because I made most of the photos. And because this way I can look at pictures of you in your green dress – yes, the one on the bottom right! What are the strengths of this blog according to you? What would you like to see more in 2013? If you could give me any advice, what would it be? To travel with me, play GTA in the summer and … more sweetie? I love your dress. 🙂 Great outfit. Haha…that's the cutest thing ever 🙂 It sounds like ye're well matched so as he sounds like a sweetie too! I love your outfit…the pink cardigan is a lovely pop of colour with the monochrome dress. hahah so cuuute! who wrote those answers? the bf? Hahaha Kenneth is too cute. "I made most of the photos". Ha ha this made me smile. Also you look so lovely in pink! I think I only own one pink item because I also thought that I needed to brighten my wardrobe. I think it's become my favourite shirt. But I still love my neutrals and earth tones. Cute outfit! I love the print on your dress! The answers to that questionare are so cute!! Oooooh his dress is great! Especially with that cardi. So cute! Glad you were able to get these cutie pics before the big snow! I love the whole look! Love the color of the cardi! And what sweet answers! I think he's a keeper! 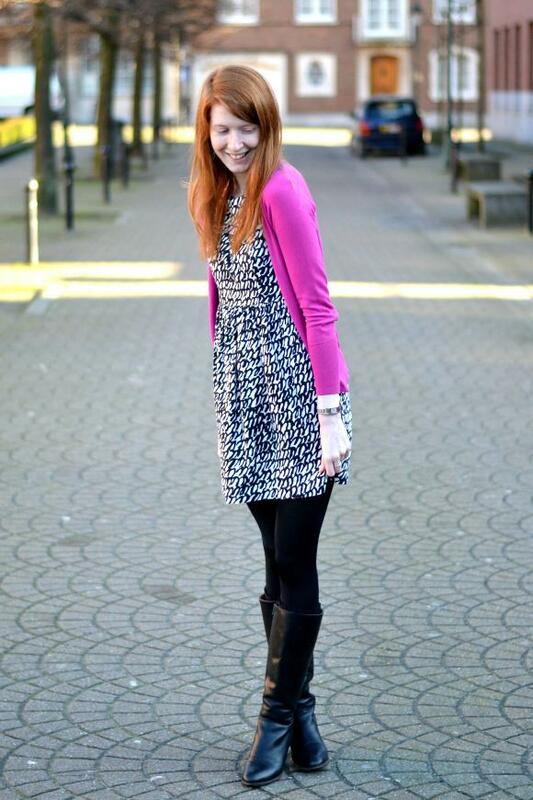 I love this cute patterned dress with the bright pink cardi. You are always so cute! I love the pattern on that dress! it's unique but not over whelming – plus it goes perfectly with the cardigan. Aw, so sweet 🙂 And I love your cool graphic dress. Stay warm! Just stumbled upon your blog. I'm from India. Would you like to be blogger frens. Though we are from diff parts of the world, we might find the the other interesting. Between I too love pairing blk & white with a bright neon color and you look fabulous here. Awww you two are such an adorable couple! I love his responses! I love this 🙂 too cute. I'm ur new follower , hope u like my blog too! Your boy is adorable. Actually, so you in the cardi. 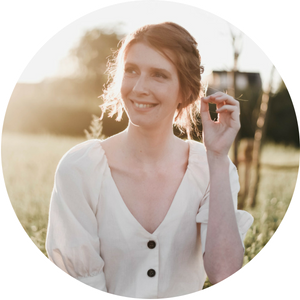 Heel leuk item om je zwart-witte outfits mee op te fleuren. De print van je jurk is echt zooooo mooi! En dat roze matcht perfect en staat je ook leuk! Mooi mooi mooi Nikki!!! Love your dress a lot! And you boyfriend seems to be a cutie! that fuchsia color looks amazing on you! you should def where it more often! You boyfriend is so sweet!!!! And you bring some spring with you pink cardigan!!! love the bright pink! pretty! beautiful cardigan and dress! the purples are made for you girl!!! Such a cute outfit!! Glad you got to snap these photos before all that snow 🙂 I definitely love the pink cardigan! And your boyfriend's responses are SO cute – what a sweetheart! Ah, you are precious! I adore that pop of purply-pink. That's such a nice shade of purply-pink. That color should exist more, because purple and pink are both so blah, but purply-pink is so nice. I love this dress! The cardigan is a great color, too! Definitely a great piece to layer with this spring! oh wow Nikki, it's like night and day between your posts. holy snow fall but at least you got in these sun-sational pics! anyways though, i love the snow and seeing you maximize it's beauty!! your dress + cardy combo is just adorable, i always feel as if i'm sneaking my nighty out and about when i wear something this comfy around town 😉 isn't it awesome being a girl and parading around in sweet dresses?!! those boys don't know what they're missing. baha! i recently color blocked my closet and found out i don't have many pink items either, i thought it was the opposite for sure. so weird! i think that color is tremendous with your hair and eyes. you look amazing lades!!! You look beautiful! I thought of you last night, look at photos from the inaugural meeting of the League of Extraordinary of Red Heads – http://www.timesunion.com/seen-events/slideshow/SEEN-League-of-Extraordinary-Red-Heads-55975.php I'm in the group photo, standing in the middle in a long green polka dot dress. What a great Zara dress – I love that print! Awwww, that is TOO cute! 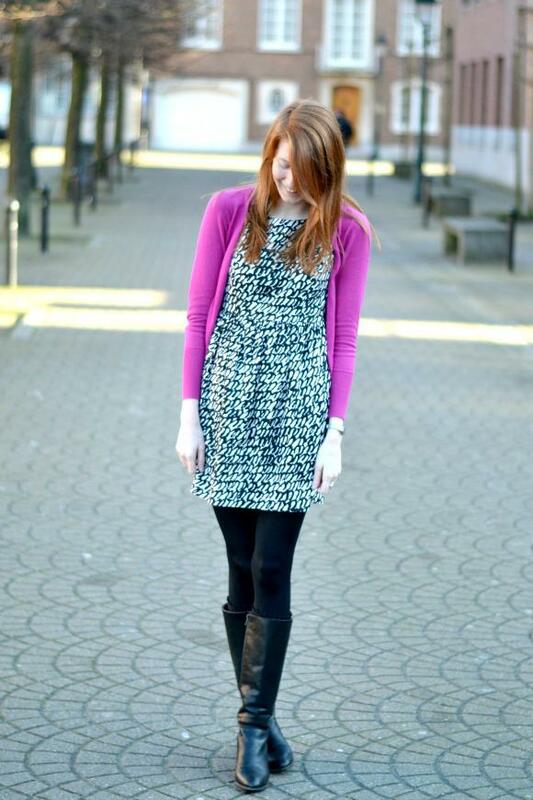 As is your pretty print dress and the bright cardigan you paired with it – very nice! That purple is DEFINITELY your color. I feel like I say that every time. Haha, but its true! The answers to that survey are too precious. You are one lucky gal! Awwww you're looking every inch adorable in that well-put together outfit…..& your fiery red hair says it all!!!! i adore the dress you are wearing here! and your boyfriend's answers to the questions are beyond cute. haha that is so funny, guess the person though you were a SWEETIE. 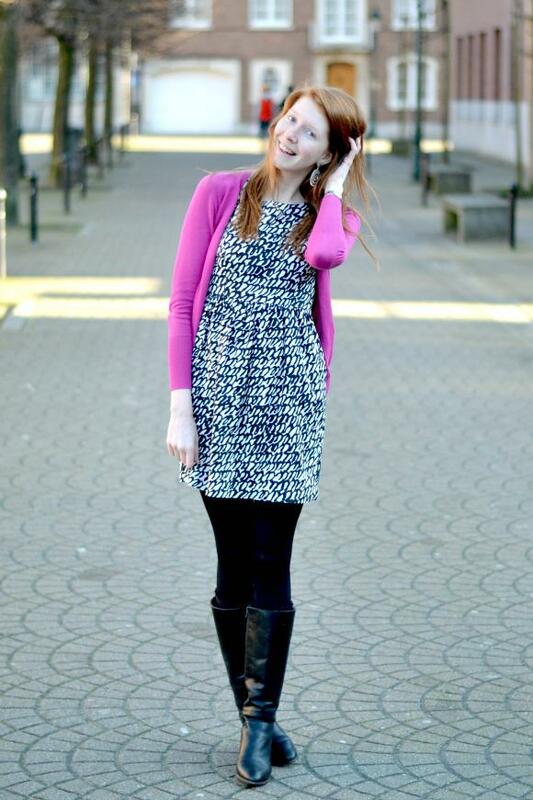 Lovely cardigan, and great blog! Wanna come by on mine, we could follow each other? I just stumbled across your blog and you are darling! I love your boyfriends answers to your questionnaire. Too sweet! & pink looks so good on you! I think you definitely need to add more of it to your wardrobe! This is such a great look! You are so adorable. Such a beautiful dress, I adore the print! Love the pink cardigan it really makes the most beautiful cover up! Enjoy the snow! You are too cute! That bright cardigan looks great with that patterned dress and I laughed when I read that survey. So adorable! Wat ben je toch een leukerd! Thanks for the adorable comment on my blo btw. You little cutie! I love hearing stories about the "men behind the blogs" – looks like you got a good one! Your new pink cardigan is a gorgeous color! I think it looks perfect with the black and white print in your dress. I love the cute answers from your boyfriend too! I don't think my boyfriend has even tried to look at my blog even though he knows about it haha.